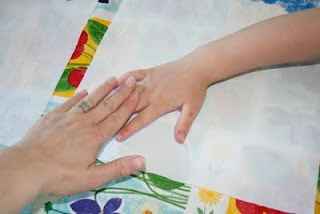 With Mother's Day right around the corner, I wanted to share with you how to make a keepsake placemat. If you happen to be my Mom or Mother-in-Law please pretend you didn't read this and act surprised when you may or may not receive this. 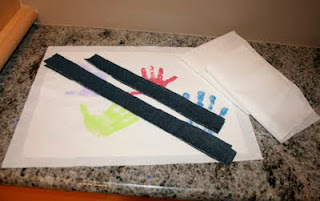 cut two strips of your accent fabric 17 1/2" x 1 1/2"
cut two more strips of your accent fabric 11 1/2" x 1 1/2"
You now have all of your pieces cut out (I did not get a picture of the fabric before my kids did their handprints, so just pretend that the fabric is still plain). Now, the fun part! 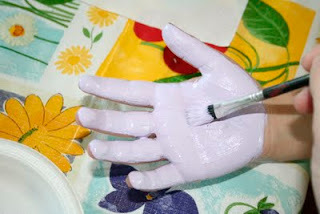 Follow the instructions of your fabric paint and paint up your child's hand. The kids LOVED this! Next, press their hands onto the top piece of your placemat. They may need a little help getting good contact. Use your hand and gently press their fingers down one at a time. 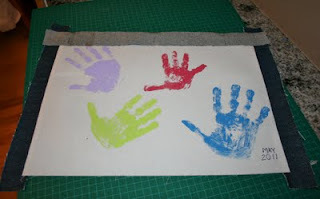 Repeat until all of your handprints are done. At this point, if you are good with a brush or have fabric markers you may want to add the date and/or names of the kids. If you prefer to embroider the information on, then wait until further into the project. 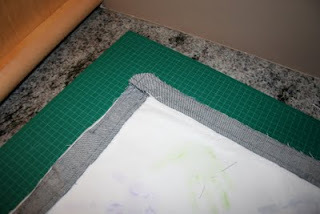 Once your fabric is dry and ready to go you can start assembling your placemat. 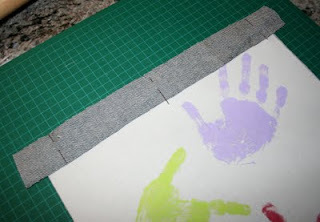 First step is to iron your fusible interfacing to the front and back of the placemat. Follow the instructions for the interfacing you have purchased. My accent fabric is denim, so it is nice and strong. 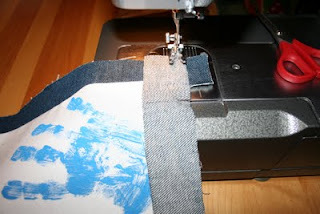 If you chose a lighter weight fabric you may want to add interfacing to your strips of fabric as well. If you have decided to embroider the date or any other information onto your placemat, now is the time to do it. I don't have an embroidery machine, so I used my free motion foot to add the date. Line up one of the shorter pieces of your accent fabric to the short edge of your placemat top. Pin in place. I accidentally cut my strip longer than it needed to be. The length of your accent piece will match the length of your placemat. Repeat for opposite side. 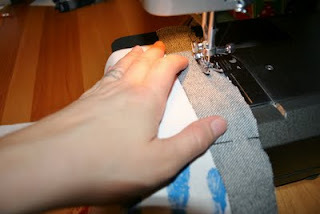 Sew﻿ the outside edge together with 1/4" seam. Repeat for other side. ﻿Press seams open. (no picture of this). Next place a longer piece of your contrasting colour on the long edge of your placemat top. Your placemat will not have the ends sticking out like mine did. Pin in place. Repeat for opposite side. Pin fabric right sides together. Turn your placemat right side out. Make sure you poke out your corners so they are nice and square. Iron placemat then top stitch 1/8" from edge. And you are done! Your finished placemat should be about 12 1/2 " x 16 1/2". This would be a wonderful idea to do yearly. 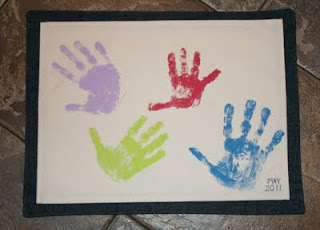 How much fun would it be for these placemats to come out and have your children or grandchildren comparing how much their hands have grown each year. 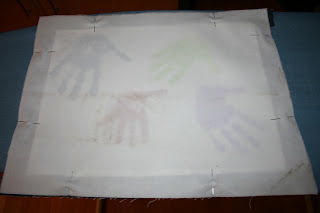 If the placemats get used and get stained, it is still all good, just adds character!